Pfc. KENNETH .SCROGUM, 22. son of Mr. and Mrs. William D., Scrogum, Throckmorton. participated in Operation Red Devil' in December, one of the biggest parachute assault exercises ever held in the Canal Zone. 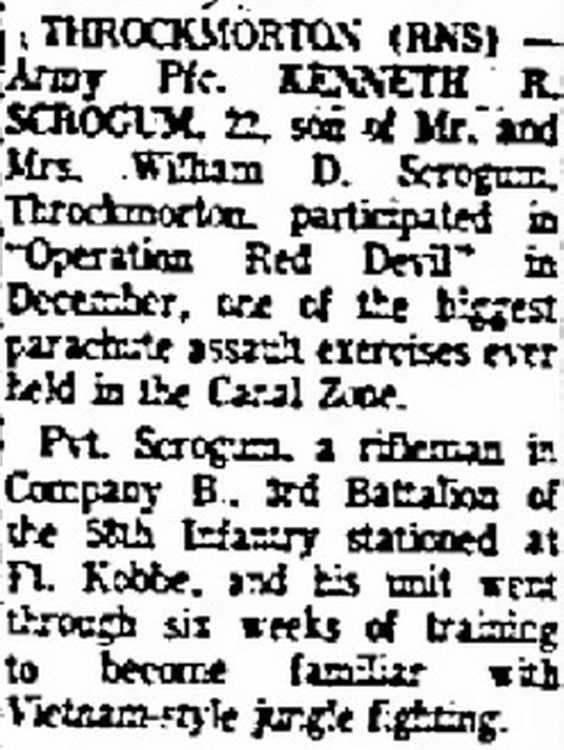 Pvt Scrogum, a rifleman in Company B, 3rd Battalion of the 508th Infantry stationed at Ft Kobbe went through six weeks of training to become become familiar with Vietnam-style jungle fighting. EAU CLAIRE Army Private Van French, son of Mrs. Mable French, Eau Claire, participated in "Operation Red Devil" recently, one of the biggest parachute assault exercises ever held in the Zone. Pvt. French, gunner in Company A, 3rd Battalion of the 508th Infantry stationed at Ft. Kobbe, and his unit went through six weeks of training .to become familiar with Viet Nam-style jungle fighting. The exercise consisted of live-fire squad tactics, platoon jungle operations [and] maneuvers' through a jungle reaction course. Army Pvt. 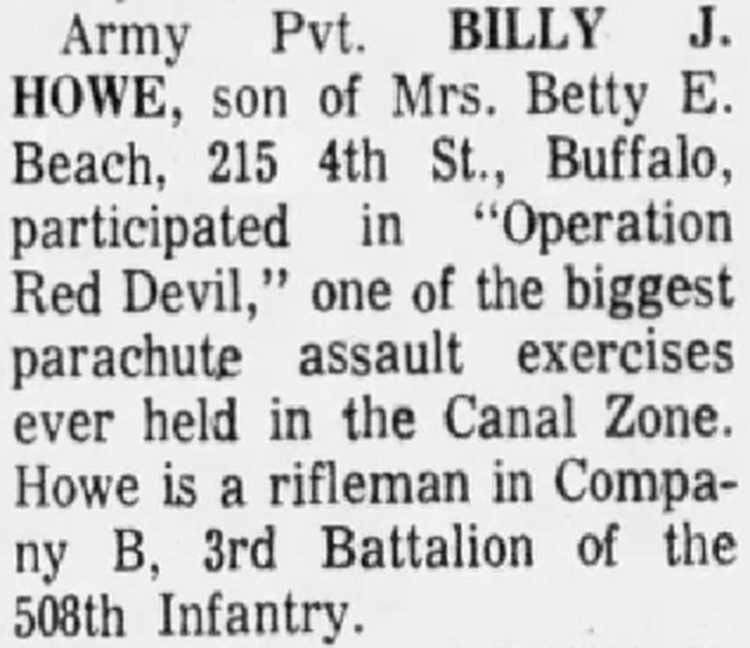 BILLY J. HOWE, son of Mrs. Betty E. Beach, 215 4th St., Buffalo, participated in "Operation Red Devil," one of the biggest parachute assault exercises ever held in the Canal Zone. Howe is a rifleman in Company Company B, 3rd Battalion of the 508th Infantry. PFC. JAMES VAN TREESE TAKES PART IN EXERCISE Recently participating in "Operation Red Devil" was Army Pfc. James B. Van Treese, son :of Mr. and Mrs. James B. Treese, 144S N. 40th. 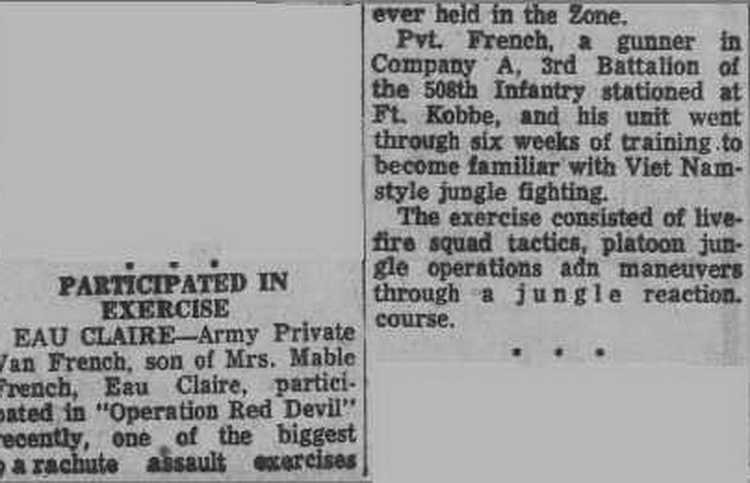 Operation Red Devil was one of the biggest parachute assault exercises ever held in the Canal Canal Zone. Pfc. Van Treese is a training noncommissioned officer in Headquarters Company, 508th. Infantry. 3rd Battalion stationed at Fort Kobbe, C. Z.
Pfc Larry J: Fike, 19, son of Mabel .V. 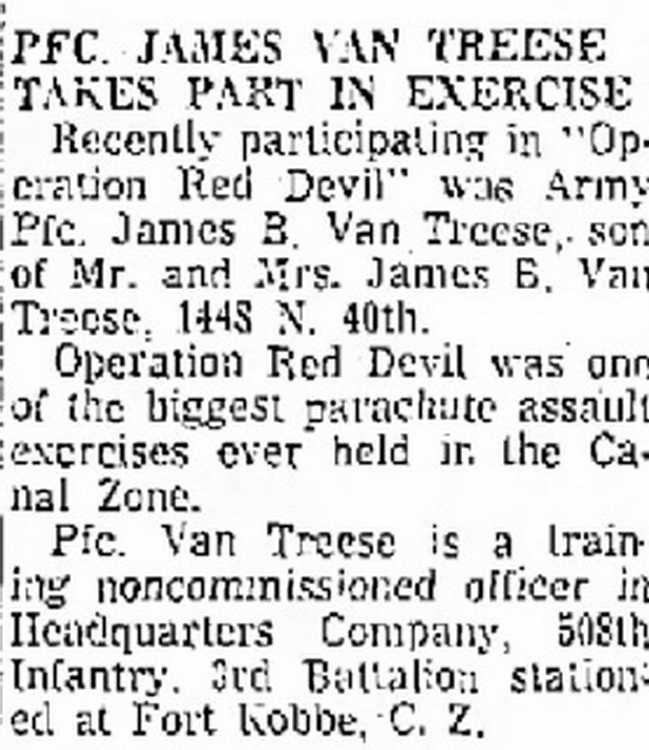 Fike, Varndell street, Uniontown, Pa., participated in "Operation Red Devil" in December, one of the biggest parachute assault exercises held in the Canal Zone. Pvt. Fike, a member of Company B, 3rd Battalion of the 508th Infantry stationed at Ft. Kobbe, and his unit went through six weeks of training to become familiar with Vietnam-style jungle fighting. Army Pvt. 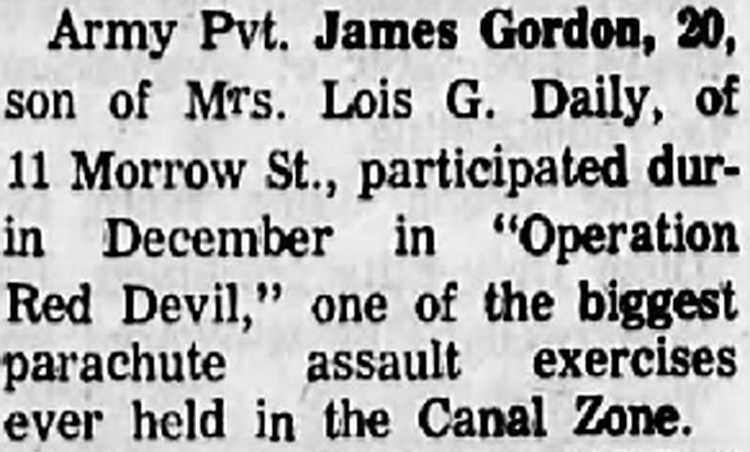 James Gordon, 20, son of Mrs. Lois G. Daily, of 11 Morrow St., participated during December in "Operation Red Devil," one of the biggest parachute assault exercises ever held in the Canal Zone.